Some 40,000 undocumented Rohingya refugees are being adversely affected by a government ban four months ago on NGOs working at two makeshift sites in southeastern Bangladesh. In August, Bangladeshi authorities ordered three NGOs - Médecins Sans Frontières (MSF), Action Against Hunger and Muslim Aid UK – to stop the formal delivery of humanitarian services, including health care and nutrition assistance to undocumented Rohingya refugees, saying such services would encourage more to flee to Bangladesh. According to the UN Refugee Agency (UNHCR), there are more than 200,000 Rohingyas in Bangladesh, of whom only 30,000 are documented and living in two government camps assisted by the agency. Some 12,000 documented refugees live at the Kutupalong camp in Cox’s Bazar District, with another nearly 18,000 further south at Nayapara - both within 2km of Myanmar. The 40,000 undocumented refugees live on the periphery of the two official camps. Documented refugees are provided food rations by the World Food Programme (WFP), along with shelter assistance, non-food items, water/sanitation services, vocational training and supplementary feeding for malnourished refugees by UNHCR. However, most Rohingya - a mainly Muslim ethnic group who fled persecution en masse to Bangladesh from Myanmar’s neighbouring Rakhine State years earlier - are undocumented. UNHCR has not been permitted to register newly arriving Rohingya since mid-1992. Only those who are documented receive regular assistance, while those who are undocumented are largely dependent on a handful of international NGOs who until recently were allowed to work in the area. Prior to the government ban, conditions in the makeshift camps were described by Physicians for Human Rights as “among the worst they had ever seen”. 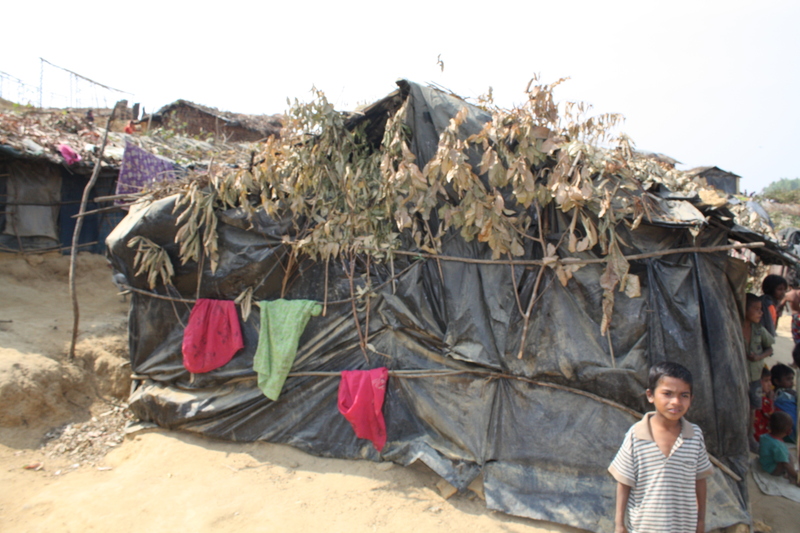 Most people outside the Kutupalong camp are housed in ramshackle huts made of twigs and plastic sheeting, denied food aid, and live beside open sewers, the Boston-based group says. In its most recent survey, MSF found that global acute malnutrition, one of the basic indicators for assessing the severity of a humanitarian crisis, was as high as 27 percent at the Kutupalong makeshift camp, where an estimated 20,000 unregistered refugees live - almost double the emergency threshold of 15 percent set by the World Health Organization, as reported in international media. No further surveys have been made since the ban took effect. In June, the Bangladeshi authorities effectively closed the door to Rohingya fleeing communal violence in Rakhine State in June and October which left dozens dead and thousands of homes destroyed. "We are not interested in more people coming to Bangladesh," Foreign Minister Dipu Moni told reporters at the time, noting that Bangladesh was already a densely populated country and could not afford a fresh influx. Government figures suggest 200,000-500,000 undocumented Rohingya live in villages and towns outside the camps, many of them in Cox’s Bazar, Bandarban and Chittagong. UNHCR has repeatedly called on Dhaka to lift the ban, but more than four months on it remains in place, leaving aid workers reluctant to comment on the record. “The situation here is very bad, it’s horrific,” Shahina Akter, a local nutrition volunteer who asked that her organization not be identified, citing issues of severe malnutrition. “Because of the ban, it’s harder for us to help the Rohingya,” another aid worker who asked not to be identified, confirmed.